I want you to repeat after me? Seriously tho! This profession takes MAJOR FOCUS AND DETERMINATION! If you don't learn to prioritize and say no so that you have time to say yes when important opportunities arise, you will either be unprepared because you'll be so pressed for time, or you will not be able to accept awesomeness when it comes your way. Some people are GREAT at this. I, personally am HORRIBLE at it. UGH! I get so excited and I really love so many things in this world, so I have a very hard time prioritizing. Last week was one of those weeks when I was smacked in the face with the fact that I can't do it all. The week started with a surprise 60th Birthday party for my dad, which was so much fun but exhausting, then somehow (after my return from my maternity leave) I ended up with a full voice lesson teaching schedule (which is AWESOME), and I taught a great musical theater workshop in the mornings, then Frankie had his first dance recital at ADBA, which I also agreed to narrate, my students at TMR had their production of Bye Bye Birdie, I work for my dad's tree trimming company from home as well, and my new magical mascara has been selling like hot cakes, plus we had a Birthday party all day Saturday, AND I WAS SINGING 3 NEW-TO-ME-SONGS AT AN EVENT ON SUNDAY. Needless to say by the time Sunday came around I was beyond exhausted. Not only was I worried that I wouldn't be on top of my material mentally, my voice was ridiculously tired. I knew I just needed to stay as focused as possible and rest my voice as much as possible, but I also knew that I would have given a better performance had a I not been so stinkin' over booked!! The performance went better than expected, and my students (Lily and Jordan) who sang with me were rock stars! I had a weird issue with one note in my first song because of the tiredness, but got through it, and totally screwed up the words in the middle of I Know it's Today, but I kept going and didn't let it stop me. 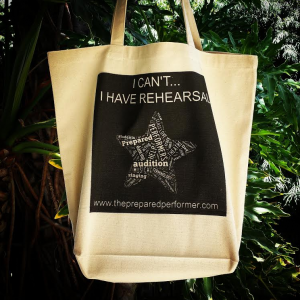 As the stage manager at The Fireside used to say to understudies who were going on, “Tell the story and don't fall in the pit.” I love that phrase, but I love the idea of being prepared even more. I also wasn't stoked on my high belt note on “The waaaaaaaaaaaiting!” It was fine, but I'm usually pretty proud of my high belt, and I know I was just too tired for it to be as stellar as it could have been. Luckily, I felt pretty dang good about a new song, Calm from Ordinary days, that I was singing. The only real goof I made was saying “my thesis” instead of “my notebook”. In the grand scheme of things, that was pretty amazing considering it's the fastest, most wordy song I've ever sang. Here it is if you want to check it out. I have compiled 4 major ways for you (aka me) to find help with saying no. I hope these ideas help! I know I am going to go back and reread the awesome Michael Hyatt post that I mentioned, especially as I continue to prepared for the upcoming GHOST LIGHT VOCAL JAM! I love his advice!! AND – I want to know any ideas you might have!! Please share your best tips for saying no in the comments below and one person who comments will be chosen at random to win this tote bag.